एक शाम मेरे नाम: तुम्हारे लिए : नैनीताल की ज़मीं पर पनपी तरुणों की सुकोमल स्नेह-गाथा ! नैनीताल मेरे दिल के काफी करीब है. इससे जुडी इतनी सुन्दर स्मृति साझा करने का आभार. मैं इसे फेसबुक आदि पर अपने संपर्कों से शेयर करने का मोह छोड़ नहीं पा रहा, आशा है आपकी सहमति मिलेगी. धन्यवाद. मनीष जी बहुत बहुत साधुवाद ...इतनी सुदर स्मृतियाँ हम सब के साथ साझा की आपने ! what a wonderful book it is!! I still remember how i felt when i first read this book 6-7 years back i was just full of tears and unable to think anything but its ending. Somewhere it reminded me of my own story. Beautiful book..expressed in a beautifull manner..!! Regards to all bloggers,I am a big fan of the book tumhare lite by himanshu joshi hi,can please someone tell me who played role of anumeha(meha)against lalit parimoo,in doordarshan serial tumhare lite,honestly I have been trying to find some info.on this as I was in my teens when this TV serial came in,an is very touchy,please please and please if anyone has any info on video of this TV serial please let me know where can I get that.regards..
greatest writing on true , pure luv in most beautiful manner . ye meri manpasand kitaab hai aur maine ise kareeb 300 baar to padh chuka hoon. himaanshu joshi ji se bhi is par bahut baar charcha hui.. aapne phir is baat kee yaad dila di. shukriya dost. 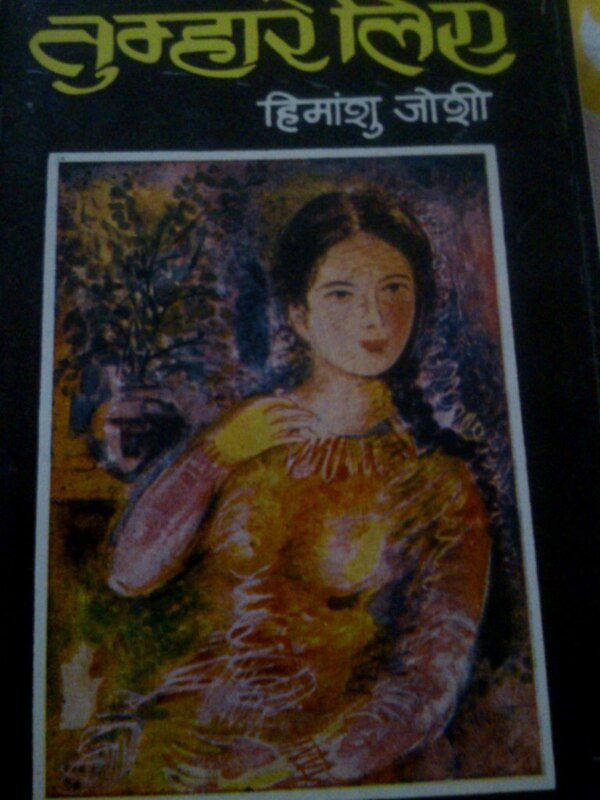 I had read this book almost 30 years back when I was probably in 10th standard. 30 years have passed.... time just flies. I was not able to sleep wondering about decision of the girl to leave without really telling where she was going. This was kind of sad ending story. In today's world of facebook and Internet where it may not be so difficult to trace people, this story may not be so appealing but overall it was very nice and refreshing novel depicting unexpressed romance of young guy and probably the girl as well, which was a mystery. I also remember the title song of the television serial which was melancholic. Can anyone kindly guide me where I can get that song or at least the lyrics. Thank you so much Mr. Kumar, thanks to your post I discovered the name of the author and the book. However, the book is out of stock in Flipkart. I have been searching for a few lines I think someone recited in this serial - comparing how sadness is more deep and enduring than the superficial exuberance of happiness (if I remember correctly, I was only 12 years then I think). I will be so grateful if you by any chance can tell me if such lines exist in this book? Prita Its difficult to search unless you remember the character who uttered these lines. Also script of the serial may not be same as narrative of the book. Really a nice story. True love. Unbelievable. I read this book first time in 1988 and till to date I myself don't remember how many times I have read it again and again. Had chance to talk to Himanshu Joshi ji also. One of my favorite book.